If you key<DSA Driving Test> into Google you get three booking agency websites that charge you up to £30 to arrange a service you can easily do yourself for nothing. The same happens if you key <Photo Licence Renewal> into Google. Below, we invite you to comment on this story and recount your own experiences. The Driving Standards Agency (DSA) is advising customers to avoid copycat websites and save money by coming to the agency directly. DIRECTDRIVINGTESTS.ORG tells you upfront it charges £20 for its 'service' and does offer a button 'BOOK' enabling you to bypass its 'service' and go to the DSA site directly. But if you opt for "The Easiest Way To Book Your Practical Driving Test" you hook into its 'service'. Another one, bookingsdirect.org, does not offer a direct link to the DSA, and does not tell you how much you will have to pay until the end of the process. While book-driving-tests.org charges £31 for a Theory Test and £62 - £75 for a Practical Test, depending on whether it's on a weekday or a weekend. All these are the first three you see on Google. The DSA says, "Some websites also charge for ‘pass protection’ with the promise of a free re-test that very few customers would ever qualify to use." "Some companies charge up to £30 for just booking a test, on top of the driving test fee itself." Coming to DSA directly saves money and gives you instant confirmation of your driving test appointment. You can book a theory test at www.gov.uk/booktheorytest and a practical driving test at www.gov.uk/bookdrivingtest. If you key <Photo Licence Renewal> into Google you get a similar set of 'services' offering to help you renew your licence. They are again orange, like the old .gov.uk sites. They do offer small print warnings. But if you go straight to the ‘Apply for your Licence’ button, the site asks for all the details, charges £50 and then sends you a completed form to send to the DVLA which asks for another £20. Had you simply gone to https://www.gov.uk/browse/driving/driving-licences , all you would have had to pay is the £20. “It’s unacceptable that some of these websites try to trick learner drivers into paying an extra fee to book their driving test. In response to complaints from DSA, the Advertising Standards Authority has ordered a number of websites to remove wording that could mislead consumers into thinking they were using the official booking service. Last month, the website book-theory-test-online.co.uk was fined £85,000 by premium rate phone regulator Phone Pay Plus for ‘very serious’ breaches of its code. 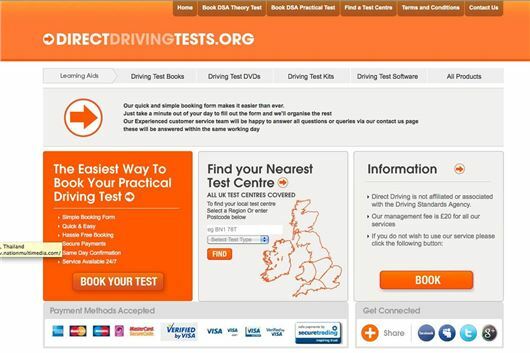 GOV.UK is the only official driving test booking website for both theory and practical tests. If you’ve used an unofficial booking website, the Citizens' Advice Bureau can tell you about any course of redress open to you in your case. Just used one of these (booktheorytesttoday.com) as thought i had clicked gov site, but google on my computer always re-adjusts page as paid ads at top arrive. Was rushing and didn't even notice until I had paid i wasn't on .gov site!! paid 48.99, so a nice 17.99 admin fee to cover the costs of paying to put their google ad. at the top of the page!! Tried to cancel. They have no working tel. number and a contact form that says they endeavour to respond within 2 days!! Sent e-mail to cancel, but not hopeful of any refund even though I sent it 10 mins after booking and they take 3 days to 'arrange' the booking. Have e-mail confirmation of application, but not received date of test, as takes up to three 3 days for them to go on the gov. website to do it!! Makes me sick. My wife got caught out paying for a NI number in same way. Thought she was on the gov site. Gov. should demand that public sector service sites automatically top pages (and ban co's from doing this 'service' by blocking their accounts for payment or blacklist for google to refuse to display ad.s.) People that set these up are nothing other than fraudsters. great post i have just put up a similar page on my driving schools blog to prevent my or any other pupils from falling into this trap. this is a shameless display. Same has happened to my son.. Is there a governing body for this.. Booktheorytesttoday was used..